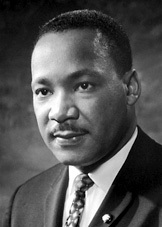 Today, 15th January, is Martin Luther King's Day. He was born 83 years ago in Atlanta (Georgia) in a time where blacks and whites did not enjoy the same rights in the USA. He will be always remembered as one of the main defenders of the Civil Rights Movement and he was the youngest person, the first black and the second American to win the Nobel Peace Prize.